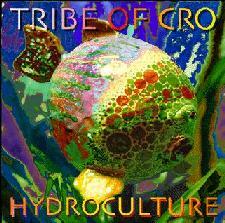 Tribe Of Cro play an [almost] all instrumental, exploratory, jamming form of spacerock that is sometimes Krautrock or metallic heavy, and sometimes trance electronic adventurous along the Ozrics/Pink Floyd axis. Based in England and Belgium the band was formed in December 1994 and its members come from such bands as Mandragora, Dr Brown, The Great Imperial YoYo, Cherokee Mist, Wegg, Bud, Giant Eyes, and Floating Temple. The musicians include Phil on keyboards and samples, Niall on guitars, samples, and keyboards, Mik on guitar, Ade on guitar, Marcel on bass, and Kevin on drums. Sporadic Spiro-Gyra is the heavier of the two discs with a core sound that often reminds me of late 60's/early 70's jam rock, but within a space context. The first two songs, the title track and "Dead Men Don't Eat Calcium", are actually two parts of a single tune, and representative of the sound on this release. 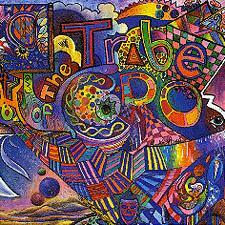 The first cut sets a driving Deep Purple sounding groove that is accompanied by trippy synth patterns. Dead Men, while retaining the same beat as the opening track goes off into more blatant Krautrock heavy territory with the last few minutes being a total liquid psych jam. "Sprinklestrap" and "Syzygy" are similar to the opening tracks, but more bluesy. The effect is great as the synths are still dripping everywhere. Some interesting contrast is provided on "Bubbled Engines Of Nim" and "Recipe For Slow Tea", which are more electronic, and, sometimes more experimental, explorations. And Recipe, while still heavy, is a more overtly psychedelic rocker with layers of competing melodies. "Be" and "Figwort" are extended jams that, in what we can now call the Tribe Of Cro tradition, explore around patterns set by the rhythm section. Though still in rock territory, the music is very psychedelic and trance-like. The bass is very up-front with an improvisational feel making for some cool melody lines. "Tocrack" is a total Krautrocker sounding a bit like early Guru Guru. Leading into "Where Science And Magic Meet", it maintains the same rhythmic pattern but goes into a psych-oriented exploration. The band provides some interesting contrast as well. "Bagalute" is a trancey, droning electronic piece accompanied by bagpipes. Very cool sounds. "Life" and "Truant" are both eerie electronic pieces that are a bit on the experimental side, and have some wild vocalizations. In summary, Sporadic Spyro-Gyra presents the heavier rocking side of the band, while Hydroculture is more trance cosmic. Both, however, are killer space discs and the musicians are clearly comfortable communicating amongst themselves during extended jams. Required accessories for listening to these discs include a space helmet and lava lamp. Just don't shoot the lamp with your ray gun. AI: I hear a lot of influences in Tribe Of Cro's music. Space, psychedelia, Krautrock, heavy rock á la Deep Purple/Black Sabbath, and even a hint of jazz. Is this a conglomeration of the various member's interests, or do you view all these elements as part of a single Tribe Of Cro whole? TOC: Erm... Errr... I don't think that there is one particular rule we follow in either our influences or in the creation of our music, we all listen to many different styles so inevitably there is going to be a wide and interestingly varied selection of ideas involved. AI: The constant element, though, is jamming, cosmic explorations. Tell me about the Tribe Of Cro creative process. Do your songs grow exclusively out of improvizations? Or is there a level of composition as well? TOC: Yes it would be true to say that all our tunes spawn from Purly near Croydon being a great industrial British highland port similar in strength to rocket fuel. I hope we make ourselves clear? AI: It seems (from the promo material) that you've all been playing this music for some years. Do you notice a renewed interest in space/psych/Krautrock, or has it never really gone away? TOC: Over the years, we seem to have maintained an excellent following throughout Europe. Belgium, and Germany, for example, have always been good to us. Recently, with the advent of the NET, we've had contact from all over the world and it seems there has always been a large interest, and now we're all connected it can only get bigger!! Yes the majority of us come from very musical backgrounds under many diffrent names with many strange and deranged releases under our communal belt. AI: Tell me about the festival you played this weekend. TOC: Well... Let us quickly clear our heads... It was called 'HIGHLIFE EXTRAVAGANJA' promoted by 'HIGHLIFE' Magazine(HIGH TIMES) in Amsterdam! The night featured five live bands of varying styles (from thrash punk to dub!). Many of Europes top 'growers' were there for the announcement of the CANNABIS CUP winners of '98 ... A Most pleasant night out! AI: I keep hearing about a frequent festival scene in England/Europe. Is there really a lot happening? How extensively do you get to play live? TOC: The only gigs we have done in England have been supporting Hawkwind, but we get to play on the continent doing small tours every 3 or 4 months which is always good fun. The festy scene in England has become more commercial what with the Criminal Justice(??!!) Bill giving the Police more power to stop what was a healthy free festival scene. Recently more people have been trying to get festys going legally, but trying to keep the old vibe of past free gatherings. For example, the Lizard Festival in Cornwall which was great. So maybe things can change. Who knows. TOC: Well the line-up of Toc can vary... The smallest(so far...) being four (gtr, synths, bass and drums) as this weekend in Holland, and up to seven (3 gtrs,2 synths,bass and drums)when we played with Hawkwind all over England. In answer to the challenge aspect I feel that we all initially thought that it wouldn't work out, but because we understand the concept of 'space' in our music and had all played in smaller 'TRIBE' line-ups before attempting the full posse of seven members. AI: The main difference I detect between "Sporadic Spyro-Gyra" and "Hydroculture" is that "Hydroculture" is less drone heavy... less metallic than "Sporadic Spyro-Gyra". And the individual musicans' parts are more distinct. Also, there are more vocal explorations, including an entire song with vocals. What are your thoughts in terms of goals/differences between the two releases. TOC: This was the first album we recorded multitrack and wasn't done 'live' directly to DAT as used to be the case. So, this time, we could add extra things such as vocals and weird sample effects, that would go down over the top of chosen jams, giving us even more scope for weirdity and strangeness, limited only by our imagination! AI: Is Tribe Of Cro an all-British band? I gather from the promo material that your members might be from various countries. TOC: Yes we are a multi-national band. The drummer KEV, is from BRUSSEL SPROUTS, the capital of BLEEGIUM. And our guitarist (MIK) lives in WALES (usually of the sperm variety). The rest of us all live in BRIGHTON, ENGLAND. AI: Final question: What does Tribe Of Cro have planned for the summer/future? TOC: Lots. Planning of a TOC studio in Belgium, summer festy dates, a Euro tour of Belgium, Holland, Germany, Italy, Switzerland and Hungary. Also, in May, we are doing some dates with Hawkwind in Europe, but I am sure you will hear about them closer to the dates.